We were in Kintamani on the island of Bali in Indonesia. It was a sleepless night as our neighbours were yelling and partying until midnight. Ok, so midnight isn’t actually all that late and we would have joined them if we didn’t have to be up in 3 hours to climb a volcano! Nick actually had to go and ask them to be quiet, which seemed pretty lame as they were about the same age as us. 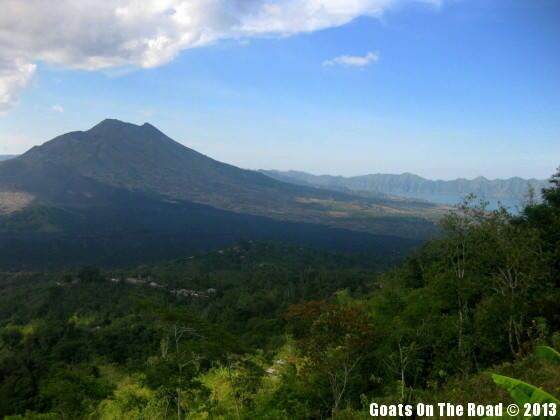 Beautiful views of Mount Batur and Lake Batur in the Kintamani area, Bali, Indonesia. After a restless 3 hours of sleep there was a banging at our guesthouse door. It was our guide and it was time to put on our hiking shoes. It seemed insane to get up after such little sleep and start doing physical exercise, but that’s why we had come to Kintamani, to climb the 1700m high Mount Batur Volcano and watch a beautiful sunrise. Bring it on volcano! View from our guesthouse in Kintamani, Bali. Trying to keep warm in the hut at the top of the volcano in Kintamani, Bali. The walk was mostly flat for the first hour to get to the base of the volcano. 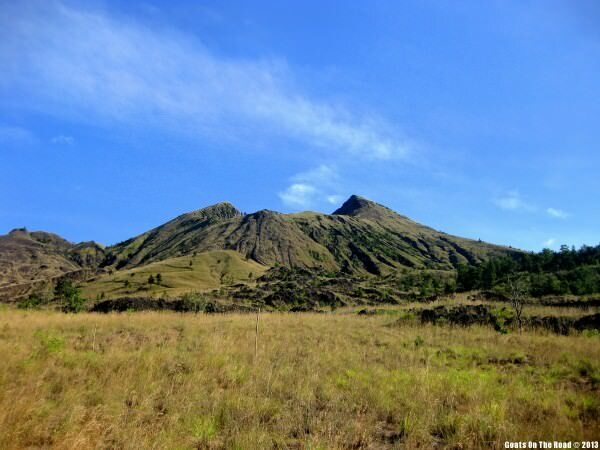 Once we started to climb, the scenery changed from forest and big rocks to sand and slippery gravel. We hiked at a steep incline for about 1 and a half hours, no zigging and zagging, just straight up. We were exhausted, we were cold and we had to pause numerous times because we felt ill (due to lack of sleep and lack of food in our stomachs) but once we reached the top, it made the hike up there all worthwhile. 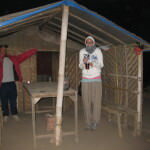 There was one little hut at the top with a fire for keeping warm and we graciously accepted some freshly brewed tea. Our guide called us over to the side of the volcano to show us something. The volcano was so hot, steam was coming out of the mountain. He dug a little hole, buried a few eggs and within 5 minutes, breakfast of hard-boiled eggs was ready! 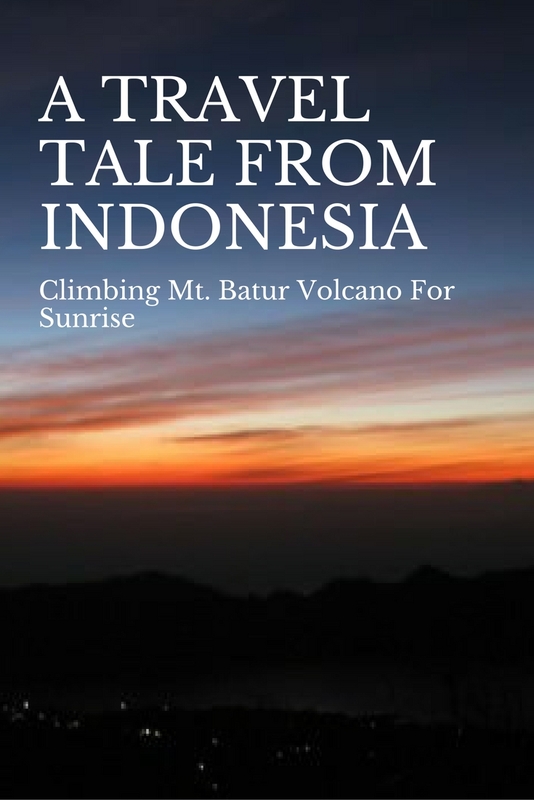 We made it to the top just in time to have some food, tea and witness the orange-red glow peer over the neighbouring mountains and Lombok Island. It was quite the sight and definitely made getting up at 3:00am well worth it. When the sun was practically all the way up, our neighbours arrived…hungover and late. They should’ve listened to Nick and gone to bed when he told them to! The stunning sunrise. Kintamani, Bali. 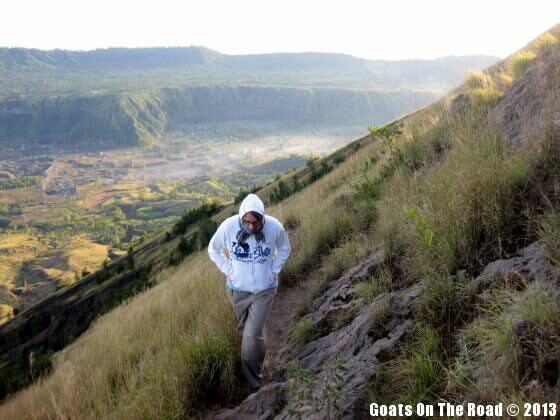 We carried on hiking around the main volcano rim and the lower volcano rim as well. This volcano had erupted in the 1920’s, ’60s and ’90s and we could even see the aftermath of the previous eruptions – black, hardened lava covered the ground. Luckily for us, the beast didn’t feel like exploding while we were up there. Hiking around the volcano’s rim. King Of The World! Notice the black hardened lava from previous eruptions. We enjoyed the stunning views of the Lake Batur down below, Bali’s largest crater lake, and of Lombok Island in the distance. In total, it was a 6 hour hike and we made it back down to our guesthouse in time for our free breakfast and promptly passed out. We were well deserving of a nap. Conquered! View from the bottom of the volcano. Kintamani, Bali, Indonesia. 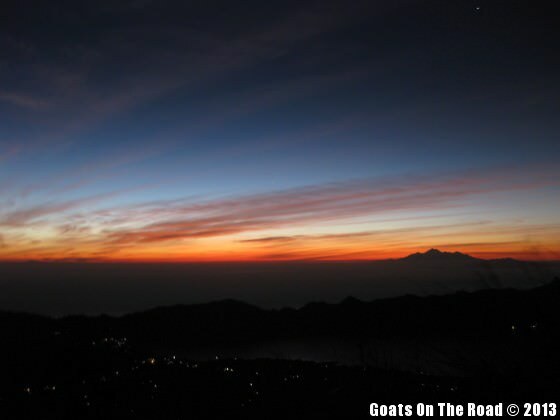 A trip to Bali wouldn’t be complete without coming to the Kintamani area. The lake, volcano, rice paddies, temples and beautiful views of the valley are stunning. 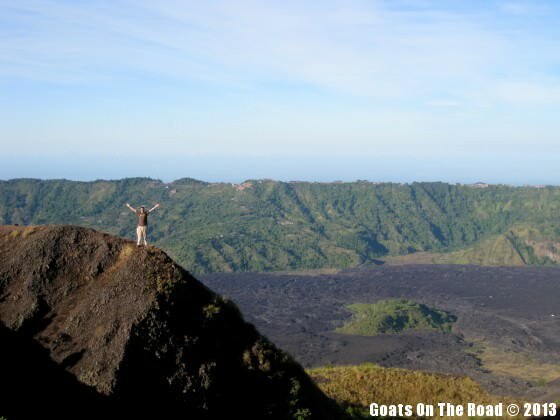 We suggest renting a car in Kuta or Ubud and exploring the region independently. There are many small villages and places off the beaten path waiting to be discovered. Thank you so much! We love your country 🙂 Hopefully one day you can visit Kintamani, it’s a gorgeous area. Awesome pictures! Awesome moments!! you experienced a great moments. thanks a lot sharing your experience.